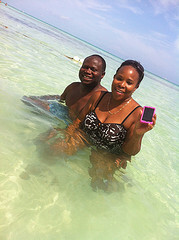 Everyone gets excited about planning a family cruise vacation to the Caribbean! Whether it is your family’s first cruise ship vacation or your tenth, there is an overwhelming amount of joy when preparing to cruise to the Caribbean. 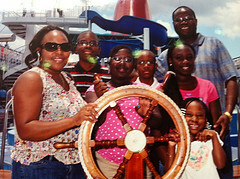 You certainly want it to be the best family cruise, right? 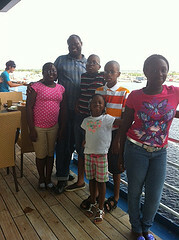 Today, I want to help you with some key things to consider as you plan your family’s Caribbean cruise getaway. 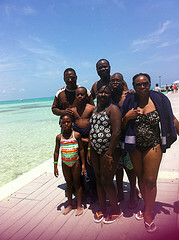 Inarguably, one of the first things to consider is the price of a family cruise package. What will you have to pay for this cruise vacation? The cost of your cruise is determined by several factors: the length of the cruise; the time of year you cruise; when you book your cruise; the cabins you choose; the cruise destination and departure port; the cruise line and ship you select; and, whether you decide participate in paid shore excursions, among other things. I will talk a little about how some factors mentioned above are important to your cruise preparation. How many days do you want to spend on vacation? Or, how many days can you afford? You can generally find 3-day, 4-day, 5-day, 7-day and even longer cruises heading to the Caribbean. What you should expect is that the longer the cruise, the more you will pay. Experience shows that if you can find a cruise that costs about $100 per person per day, that is a good deal. So, how many days can you afford for your family of 4, 5, or 6 people? That is one thing to decide early, when planning your family cruise vacation. The most popular time to cruise is during the summer. However, that happens to be the most expensive time, along with major holidays, to cruise. If your family members are all past school age, then the best time to cruise is during the fall – September through early November. The prices are lowest during those months. However, if like me you have children in school, you are forced to cruise when school is out. That means spring break, summer or Christmas break. In that case, choose sailings early June (for kids who are out of school May through July) and August sailings (for kids out of school June through September). Would you like to cruise some other time – spring break or Christmas? That takes us to when to book your cruise. It is advisable to book your family cruise package during the “early saver” period, which is normally about 5 months before sailing on a 7-day cruise, or 3-months on a shorter cruise. It is found that the best prices are available during the earliest months. In addition, if the price of the cruise falls up to 3 days before you sail, call the cruise line and some will likely give you the difference as onboard credit (cash to be spent on the ship). Carnival Cruise Line is famous for doing this. Amazing cruise deals are also sometimes found weeks or days before a cruise sailing. This happens whenever the cruise ship has several unsold cabins. The cruise line makes a sterling effort to fill every cabin before departing port and you may just get lucky to find a super family cruise discount. The cabin you choose will help determine how much you spend for your cruise ship vacation. 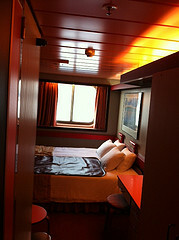 Cabins are considered “real estate” onboard the ship. You will pay less for an inside cabin than an outside cabin (oceanview – you can see the sea from your cabin). You will pay more for a suite or a cabin with a balcony than for an inside or outside cabin. 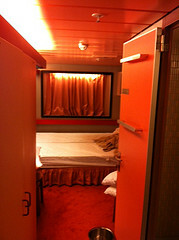 You will pay more for a cabin in the middle of the ship than for one near the front or back. You will pay less for a cabin with just bunk beds than for one with a mixture of bunk and twin beds. In addition to the type of cabin, you will pay based on the number of people in each cabin. Generally, the first two people in the cabin pay the posted cruise price, while the third, fourth or fifth persons pay less – sometimes as much as a half less than the first two tickets cost. Where possible, you are encouraged to put as many people as you can in each cabin. My family of five has stayed in one cabin on occasion, and at other times we have used one oceanview and one inside cabins. Caribbean cruises visit the Bahamas, Eastern Caribbean, Western Caribbean (including stops in Mexico and Central America) and Southern Caribbean ports. You will need to decide where you want to go. Note that shorter cruises generally visit the Bahamas and the Western Caribbean – places like Jamaica, Cayman Islands, Mexico, etc. Longer cruises head to the Eastern Caribbean to such ports as San Juan, Turks & Caicos Islands, St. Thomas, St. Maarten, etc. and to the Southern Caribbean. Where you wish to go will also determine the port from which you sail. There are several U.S. cruise ports with sailings to the Caribbean, but all do not offer sailings to all Caribbean destinations. Therefore, your cruise departure port is interlocked with the Caribbean destination you choose. Depending on where you live, you may have to fly to a cruise port. You may even need to consider staying at a cruise port hotel. Therein lay additional expenses. You may go for an all-inclusive cruise package that includes your cruise fare, flight to the cruise port, and transfers to/from the airport. Or, you may book each separately. Sometimes you will save by booking all together, and other times you will not. You can have your travel agent check on the best way to book your cruise travel package. Carnival Paradise on left. Norwegian Dawn and a Princess Cruises ship on right. Which Cruise Line and Ship To Choose? 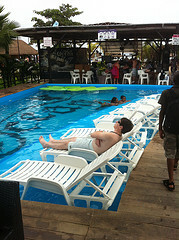 There are several popular Caribbean cruise lines from which to choose. Some cruise lines offer all year sailings to the Caribbean and others do not. 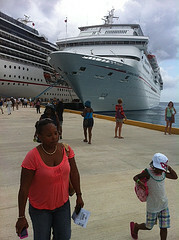 Generally, you can find sailings on Carnival, Disney and Royal Caribbean at any time during the year to the Caribbean. Other cruise lines like Norwegian, Holland America, Princess Cruises and Celebrity Cruises do not offer year-round sailings to the Caribbean. In addition to availability, some cruise lines charge more than others for the same length cruise. Your family will pay less on a Carnival Caribbean cruise than on a Royal Caribbean cruise to the Caribbean. You will pay more for a Disney cruise package than for any other Caribbean cruise package. 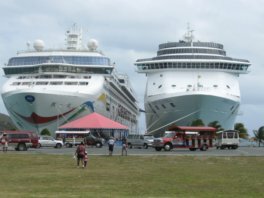 A final word on cruise lines – The size of the ship matters to price. You will pay more on Carnival Dream than on Carnival Legend (the Dream is bigger) and you will pay more on Symphony of the Seas than on Adventure of the Seas (Symphony of the Seas is much bigger - biggest cruise ship to date). You need to choose your cruise line and ship carefully, if you are concerned about price. Finally, there are some other things to think about as you plan a family cruise vacation to the Caribbean. Some cruise lines add an arbitrary gratuity charge (per person/day rate) to your cruise bill. Others suggest a per day cruise gratuity rate. Note: The gratuity is for the many people who serve you onboard the ship and is therefore quite reasonable. Based on your cruise experience, you may request that the gratuity amount being adjusted up or down. Learn from your travel agent what the cruise gratuity rate is for your chosen cruise line. There is also the question of whether you buy shore excursions from the cruise ship for your family. Shore excursions are popular and some are very expensive. Some are best booked through the ship’s Excursion Desk, while others you may book on your own prior to leaving, or when you arrive at a respective port of call. Explore shore excursions and their prices before you leave. You can ask your Travel Agent to help you look at some, or you may visit the cruise line’s website and check out their shore excursion offerings. This has been quite a lot to give you. However, it has been my pleasure to bring you this information and I sincerely hope that it will prove helpful in planning a family cruise vacation to the Caribbean. By the way, you may want learn more about the cruise travel documents needed, as well as find out what to look for in the best Caribbean cruise lines.